If you don’t know about and who CW is, check out Monday’s post: Meet CW. Then she mixed the tar out of sliced strawberries with honey (to help the strawberry juice come out to play with the honey) and poured that on top, put Dream Whip over that, and served it up once a year in summer after picnics in the park. Don’t know why, but that’s always when we had strawberry shortcake–after picnics in the park. Anyway, since we very rarely had anything sweet, this was such a lovely treat and I particularly loved the flavor of the ripe berries with the local, raw honey. Mom’s simple strawberry shortcake was so delicious, and just the idea of it brings back fond and mouth-watering memories. 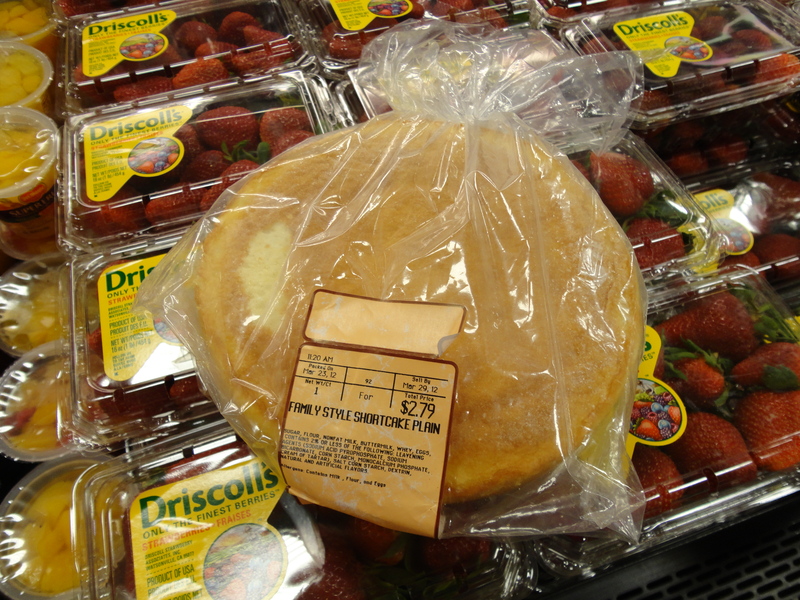 But I wanted to be able to create it at home because, although we can still find the exact same shortcake at Dillons that Mom bought twenty years ago, who knows how long they’ll continue to make these and when they stop, I still want to be able to enjoy CW’s shortcake. And I want my grandchildren, or great nephews and nieces at the very least, to be able to enjoy this shortcake. And their grandchildren after that. CW’s shortcake must live on! Since my youngest sister, Lacey, manages a Dillons deli, I first checked with her to see if she could possibly snag the recipe for me. In a way, I was happy to hear they weren’t baked in house but shipped in. That meant it was experimentation time! I’m not always in the mood to create a recipe from scratch, but I was definitely up for this challenge since the shortcake holds a special place in my heart. Based on the cake’s texture, flavor, and the ingredients, I decided this cake was pretty much a low-fat sponge cake so I Googled a lot of recipes to create my own that reflected these ingredients as closely as possible. I did omit the buttermilk since it seemed too fussy to have two different kinds of milk, but did add in some vinegar to replace the acidity lost. I also didn’t mess with any ingredients cooks normally wouldn’t have in their kitchens, like whey and dextrin. What is dextrin anyway? The cake from Dillons is crusted with sugar so I did that with mine, though it’s not necessary. It’s just kinda pretty. :) The cake I created is very spongy and dry, perfect for absorbing the delicious honeyed strawberry juice. Because of its texture, I really wouldn’t recommend using it in any recipe that doesn’t have a juicy topping–that juice is really needed to soften the cake. While the cake is very soft and bouncy to the touch, the texture is tough to cut because it’s so spongy, and it’s hard to cut with a fork until the juices have flowed down into the nooks and crannies of the cake. Once that happens though, you have tender, strawberry cake magic. I stuck with CW’s recipe for the strawberry topping, only using the berries and honey, and it’s just so stinkin’ good. Please try this topping, even if you buy your cake. Just make sure your honey is local and raw to get the best flavor. Also, local raw honey can help with allergies! Bonus! For the whipped cream, you can use whatever you prefer–Cool Whip, Dream Whip, real whipped cream, or you can use the recipe for stabilized whipped cream I shared yesterday. I first made it with the stabilized whipped cream and the second time with Cool Whip and it was loved both ways. The strawberry topping is the star of this cake and I don’t think you can go wrong as long as you’ve got that. Who would have thought that honey and strawberries could create such magic? This cake is perfect for making ahead. Prepare each component in advance, then assemble right before serving. For the cake, in small saucepan, heat milk until bubbles form around edge of pan. Remove from heat; set aside. Preheat oven to 350 F. Grease and flour two 8” round cake pans; set aside. Sift flour with cornstarch, baking powder, baking soda, and salt; set aside. In small bowl of electric mixer, at high speed, beat eggs and cream of tartar together five minutes on high speed, until light and foamy. Gradually add 1 cup of the sugar, beating for an additional five minutes, or until ribbons form. Add vanilla and vinegar and mix just until combined. Blend in flour mixture on low just until smooth. Add warm milk and beat just until combined. Immediately pour batter into prepared pans. Bake 25-30 minutes, or until cake tester inserted in center comes out clean. Turn the cakes out onto cooling racks. Place the racks over the sink and while they are still hot, using the remaining ¼ cup sugar, sprinkle sugar over the tops and rub it along the sides of the cakes. Allow to cool completely before wrapping in plastic wrap or putting in gallon-sized Ziploc bags until ready to use. You will only need one cake for this recipe so you can either freeze one for later, or double the berry topping and whipped cream and serve both cakes at once. For the berry topping, combine the strawberries and honey in a medium bowl and stir for about 2-5 minutes, until the strawberries start to release their juices and the sauce gets thinner and takes on a red color. Cover and refrigerate until ready to use. If adding blueberries, stir them in before refrigerating or right before topping the cake. To assemble the cake for serving, place cake on a plate, then cover with the berry mixture, including the juices so they can seep down into the cake. Allow to sit for at least 5 minutes so the juices can soak in, then top with whipped cream, slice, and serve. 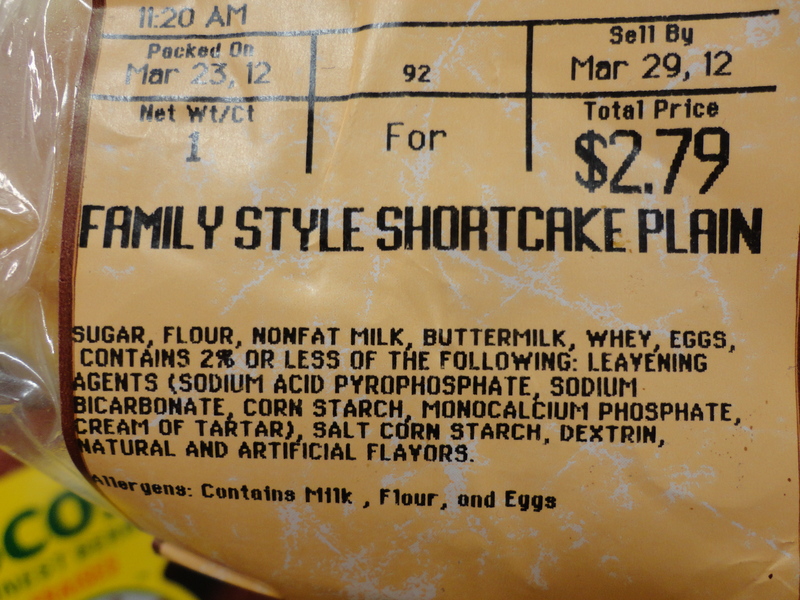 Veronica’s note: I originally used nonfat milk since that’s what is used in the Dillon’s cake. The last time I made it, I only had whole milk and it made the cake so much better for it to have a little fat, so I updated the recipe. You can still use nonfat, it’s good that way, but better, more tender, with the whole milk. Posted in Cake & Frosting and tagged baking, cake, copycat recipe, Dillons, family style shortcake, low fat sponge cake, recipe, sponge cake, strawberry shortcake, summer. Bookmark the permalink. Can’t wait to try this! Although, I don’t like whipped topping, I have a feeling my family will love it! My daughter doesn’t like frosting (I know crazy, right!? ), but she loves strawberries. I am going to make this for her. Two questions: One, where can we get good, local honey in Wichita? Two, do you have a recommendation for a good sifter? Mine stinks! It is just from Target and has the handle you pull, but it does not work very well and takes quite some time to sift anything! Yes. She is crazy. ;) Go to Whole Foods or Food 4 Thought–they both sell good honey. Sometimes Dillons has Fowlers but that’s rare any more. I know about your sifting woes! I had the kind you squeeze-takes forever. I will ask my hubby-he found the old fashioned kind for me that you crank but he’s not here right now. Will get back with you later! I went back and read the CW post, I am glad you shared it with us and I am sure it made you feel good as well. This cake looks awesome, I think Strawberry shortcake might be my favorite way to enjoy strawberries. Thanks Rhonda, I think it’s mine too! Though I do want to try stuffing them with a cheesecake filling and dipping in graham cracker crumbs. Your strawberry shortcake looks delicious! A bit of honey with the berries sounds interesting, I would be willing to try that :) I always just buy those little shortcakes when I make this. Homemade would be much better! Looks delish, Veronica! I can’t wait to try this. Thanks for posting! I would have to say that strawberry shortcake is my very favorite-est cake! So hot here in the midwest, isn’t it? Missouri =misery right now! Sure wish we could get a couple of solid days of rain. Yes and yes, please Lord bring the rain! I could eat a whole one if you made it! this looks incredible! and by the way- i loved reading about your mom :) it’s awesome how god works in families! Thanks Sarah, I agree-He is awesome. Whoa! You did such an awesome job recreating this foodie memory! The cake looks absolutely delightful! How many people does this serve? I would love to take this to my bridge group Sunday…there will be about 15 people…should I make both cakes? Yes, I would make both cakes–the cake recipe makes two, but just double the berries and whipped cream to cover them both. Hope they love it! This looks awesome! I just made your strawberry lemonade cake tonight. I tried the frosting but I haven’t tried it with the cake, I can’t wait! Oh my gosh, the video of your nephew is so cute! That is so awesome you were able to recreate the cake! Yay for that! What a strange thing to happen so hopefully that’s over now. Thank you and awwww! Thank you for posting the strawberry shortcake recipe.